Flash storage is rising above hard-drive technology to deliver new levels of speed and density, a change that could help enterprise applications achieve the performance they need both in the cloud and on companies' own infrastructure. Key to the transformation is NVMe (Non-Volatile Memory Express), the high-performance interconnect that's gradually being adopted for connections among components and systems for storage and computing. It can move data much faster than traditional protocols like SATA and SCSI, which the SSDs (solid-state drives) in most flash arrays still use. NVMe should allow for bigger and more dense flash modules. 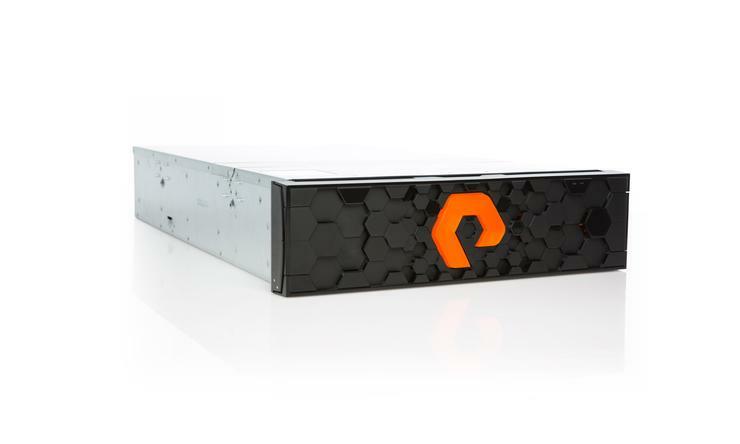 Pure Storage is tapping into this potential with a faster flash array that is adding to its product lineup this year. The FlashArray//X, which will be compatible with the current FlashArray//M and be sold alongside it, uses NVMe and drops SSDs (solid-state drives) for modules populated with pure flash media. Soon, those modules will start to get much bigger than any SSD on the market now, including an 18.3TB part coming this year. Making this feasible required moving beyond older interconnects, which were designed for systems based on much slower spinning disks and introduce a lot of overhead, Pure says. With the new, larger flash modules, those protocols would create a bottleneck. Dropping SSDs will also allow Pure to introduce a new, more efficient software architecture for the FlashArray//X, said Matt Kixmoeller, Pure's vice president, products. The software that handles tasks like wear-leveling and bad-block management on the new array's modules runs not in each SSD, as with traditional systems, but in the Pure DirectFlash software at a layer above the flash modules. That means all the media in the FlashArray//X is managed as a whole, through a software-defined architecture. A new generation of "cloud-era" applications, which may run either in a cloud or on a enterprise's own systems, demand higher performance than those of the past, Kixmoeller said. Pure says the FlashArray//X will bring the new protocol into the mainstream, affordable for more uses at more types of companies. It should cost about 30 percent to 50 percent more than the FlashArray//M. NVMe is emerging across the storage world as a response to growing application demands, but it will take three to four years for it to be adopted or even become necessary in many enterprises, IDC analyst Eric Burgener said. For most companies with all-flash arrays, the legacy hard-drive protocols are fast enough for the current level of use, he said. An IDC survey found that 46 percent of all-flash array users are only running five to nine applications on them. Eventually, most of their applications will move to these arrays, but only after IT departments get more comfortable with what is still a new type of platform, Burgener said. On the high end, vendors like E8 Storage and Apeiron Data Systems are building platforms that use NVMe both in their arrays and out to the servers that use the data, Burgener said. Only a few of these systems are in use, deployed for things like financial trading and real-time analysis of social media for marketing, he said. Pure isn't taking that step with the FlashArray//X, instead just increasing performance within the array. But it plans to add the capability next year. Pure's product rollout consists of the FlashArray//X 70 array, the DirectFlash modules that will slot into the platform instead of SSDs, and the DirectFlash software that manages the media. The products are in beta testing now, will become available to select customers in the current quarter, and will be generally on sale in the quarter beginning in July, Pure says. The company isn't completely new to NVMe. Its current FlashArray//M model uses NVMe for cache, and the recently introduced FlashBlade system for unstructured data also uses NVMe. Users will be able to add the DirectFlash modules to FlashArray//M systems they already have. This continues Pure's efforts to make forklift upgrades unnecessary. But the higher performance of the new-generation components can't be directed at specific applications if it's trapped in an older system. That might be useful for some users once they need a special performance boost for specific applications, IDC's Burgener said, but that would require flash-to-flash tiering software that hasn't been developed because it's not really needed yet. Instead, adding the NVMe parts to a FlashArray//M will simply increase the overall performance of the system, Kixmoeller said. For the ultimate boost, they will need to buy the FlashArray//X.